Carefully crafted by young worker bees into six-sided honeycomb cells, beeswax provides tiny storage units for bee larvae, honey and pollen. There are two possible explanations for why honeycomb is composed of hexagons rather than another shape. One is that a hexagonal structure uses the least material to create a lattice of cells. Another is that the shape simply results from the process of individual bees putting cells together, somewhat like the shapes created in a field of soap bubbles. Queen cells, which are constructed singly, are irregular and lumpy. Honey bees consume about 8.4 lbs of honey to secrete 1 lb of wax, so while beekeepers may remove the entire honeycomb to harvest the honey, it makes economic sense to return the wax to the hive after harvesting the honey. The structure of the comb may be left basically intact when honey is extracted from it by uncapping and spinning in a the honey extractor. Fresh, new comb is sometimes sold and used intact as cut comb, especially if the honey is being spread on bread rather than used in cooking or as a sweetener. It is tasty just to chew a sweet piece, much as you would chewing gum, and it is completely safe to swallow. Brood comb, where the eggs and larva are located, becomes dark over time because of the tracking of many bee feet. Honeycomb that is used for storing honey usually stays light colored. After harvest, the beekeeper may also keep some of the honeycomb to be melted, purified and used for a number of purposes. Beeswax has beneficial effects on the skin and it has been used in cosmetic and skin care products for hundreds of years. In the 17th and 18th centuries, women used bees wax as a foundation base for facial make up. In warm weather it would melt and in cold weather it would crack. Some believe this resulted in other women looking and commenting on the not-so-good-looking makeup and the response was “mind your own bees wax.” In other words, “mind your own business.” We don’t know if this is really true but in the 1930’s it became popular usage to mean just that: mind your own business! Beeswax has also long been used in the making of candles and while it may have once been the only product available for candle making, today it is sought after for its purity and the health benefits of burning beeswax candles as opposed to paraffin based candles. Beeswax is also a natural option for covering homemade cheese. Other uses for beeswax include hair and mustache grooming, waterproofing, rust proofing as well as polishing granite and wooden furniture. Beeswax can even be used to help repair the broken shell of a sea turtle. The uses for beeswax are endless! 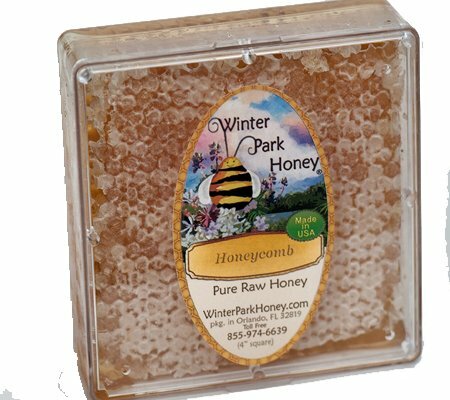 At Winter Park Honey, our honeycomb is raw and unprocessed, straight from the hive and to the box. Enjoy eating the wax too; the entire square is edible. Honeycomb makes a great hors d’oeuvre. Just put the entire square in the center of your favorite serving plate, surround it with gourmet cheese, fresh fruit and your favorite crackers. Dip a cracker in the comb, scoop up some cheese and enjoy! This entry was posted in Beekeeping, Honey and tagged beekeepers, beeswax, honey, honeycomb, raw honey, unprocessed.